My mom gave it to me when she inherited my grandmother's grand piano. I don't play anymore, but my daughter wants to, and I would like to start practicing again. It took the husband and me three hours to get it up the two steep steps from the garage into the kitchen, through the dining room and into it's proper resting place. We had to use blocks of wood to lift up each end of the piano slowly. Husband called it "cribbing", a word I never heard of until today, but I quite like. He said it was how they built Stonehenge and the Pyramids, and we would use this technique to move the piano, thank you very much. We would raise one end, then the other, and so on . . . quite a feat of engineering. And there were moments when we thought that it couldn't be done, that there was no way, despite our best intentions, we were going to get it up the stairs and through that door. Isn't that a lot like writing, or any other endeavor we are passionate about? The sheer impossibility of taking on a project is mind boggling, but we write anyway. We persist. We engage in "cribbing" with a great lump of a story, and keep raising it up on all sides to make meaning out of our words. We place down our words, like the pieces of wood, and heave, hoping that we won't make a mess of things. And sometimes we look at it and feel like giving up. What's the point of having a piano anyway? What's the point of writing? It's so ha-ha-hard! Then we take a deep breath and move forward slowly and patiently, taking the wood (words) away and put it where it is needed next. 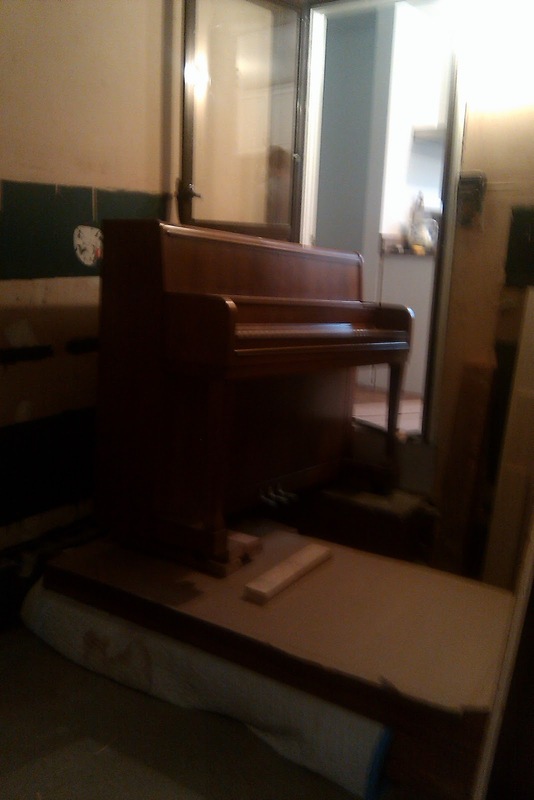 Now look - the piano is in place - and will help make our home feel warm and cozy, and will inspire us to get other things out of the garage too. Edges will find it's own warm and cozy place, and I will keep writing! My mother's (divorced) friend once cracked that if a couple can fold a beach towel together, they can survive marriage. Probably this principle applies more to moving a piano. Lordy, gal, people usually hire movers for pianos. Congratulations! We can't stop high-fiving each other! And we have been known to squabble over towels, but made it through this with nary a cross word! Neat-o post. This one and the previous. I'm one of those odd people who likes packing/unpacking and rearranging furniture. Wonderful! Love what Hope said! And is it odd that I had a tingly, tearful feeling when I read about your mother inheriting your grandmother's grand piano? I'm assuming you mean the grand piano I saw in her apartment years ago. I hope it is a blessing, and not too strange, that so many others miss her too. 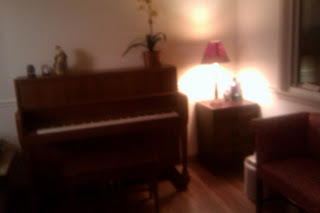 And Alison, yes - it is the grand piano that was in her apartment! And it is indeed a blessing to connect to others through her! Hi Léna! My name is Brian Ottis. I'm 25 years old living in Grand Forks, North Dakota. I've been reading your grandmother's books with the Murrys and the Austins since I was a kid. It's now been several years since I read one so I'm going to pick them back up and re-read them all! Just wanted to let you know that I'm a big fan of the books thanks to my mother. She first introduced them to me and I'm so grateful that she did. Once I get through with those books, I'd like to pick up some of your books. Do you have any recommendations on which to start out with? Dear Brian, I am so happy to know that you love the Murrys and the Austins! You will have a great time rereading - it will be like meeting old friends! I hope you will read my first novel, Edges. It was just published last week! What a great analogy to anything we hope to accomplish in life. And we don't, can't do it alone, can we? Your new living room looks great too. Something about "place" as sacred space has grabbed me recently. All that work makes it even more meaningful when it's done (having spent 4 months this summer making over a room into an office/studio for myself). Thank you Dianne! And hard work DOES make something more meaningful - even though I have to keep reminding myself of that! It's good to know that we have both been experiencing the same thing in terms of space and place! Had I known what you were about to do with that piano on the EDGE of your presentation time with EDGES, I would have tried to stop you and save your backs and the rest of your bodies. If I remember correctly, the piano at your Gran's may have been played by Rachmaninoff - I believe Madeleine said that when I played it. Ask your Mom - perhaps she knows how it came to your Gran in the first place. HAPPY CELEBRATION OF YOUR EDGES AND YOUR BODIES INTACT!! !